Netflix is giving Sabrina the Teenage Witch a very, very creepy new makeover in Chilling Adventures of Sabrina, which has finally dropped its first teaser! 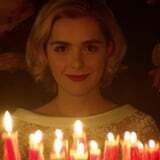 In it, Sabrina (Mad Men's Kiernan Shipka) is on the cusp of celebrating her 16th birthday, aka when she has to sign her soul away to the devil. Tonally, the trailer evokes old-school horror movies like Rosemary's Baby and The Exorcist, so even though familiar faces like Harvey Kinkle (Ross Lynch), Aunt Hilda (Lucy Davis), and Aunt Zelda (Miranda Otto) make appearances, this is going to be a totally different series than the one Melissa Joan Hart starred in years ago. Watch the teaser above before it hits Netflix on Oct. 26.